Port Canaveral, FL- The first ever daylight arrival afforded endless eye-popping views of what can only be described as a truly radiant SpaceX Falcon 9 recovered first stage booster sailing victoriously into Port Canaveral, Florida, at lunchtime today, Thursday, June 2. Because unlike all three prior perfectly erect upright landings, this booster came to rest noticeably titled, perhaps by about 5 degrees. 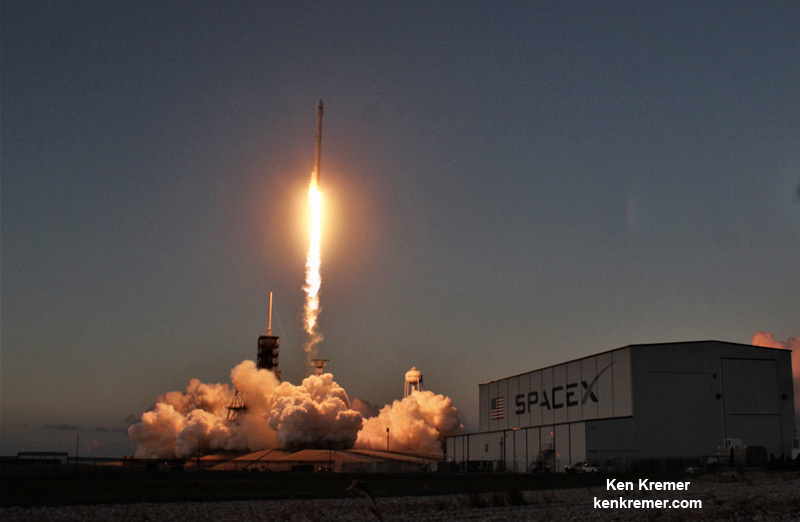 “Rocket landing speed was close to design max,” tweeted SpaceX CEO Elon Musk. That tilt gave it a distinctive character – compared to the other three – as well as significant extra technical work by the SpaceX workers to stabilize it at sea and bring it back safely and not tip over calamitously during the six day long sea voyage back to home port. “Leaning back due to crush core being used up in landing legs,” Musk explained. And since Port Canaveral and the Atlantic Ocean are public waterways, the day was filled with incredible scenes on numerous pleasure boats passing by on the seas throughout the day. Since this was the first daytime ocean arrival, there’s never been a scene quite like this. The booster landed on “OCISLY” on May 27 while it was stationed approximately 420 miles (680 kilometers) off shore and east of Cape Canaveral, Florida, surrounded by the vastness of the Atlantic Ocean. It was soon towed back by the Elsbeth III tug. By Tuesday evening it had arrived some 14 miles or so offshore Cocoa Beach, Fl., in the Atlantic. After stationkeeping for some 36 hours, the journey began anew and the the booster arrived at the mouth of Port Canaveral at about 11: 45 a.m., with a picture perfect entrance via Jetty Park pier. It continued along the Port Canaveral channel for another 30 minutes or so until docking at the SpaceX ground facility. So my day was filled with endless eye candy consisting of observing ground breaking rockets and technology that will one day lead to establishing a ‘City on Mars’ – according to the SpaceX’s visionary CEO and founder Elon Musk. 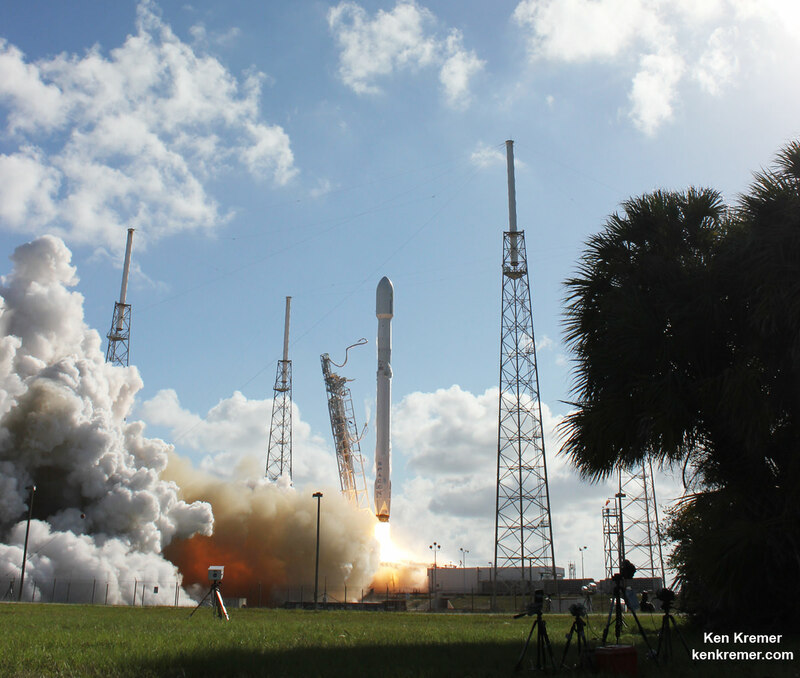 This Falcon 9 began its rapid journey to space and back roaring to life at 5:39 p.m. EDT last Friday, May 27, from Space Launch Complex-40 at Cape Canaveral Air Force Station, FL, ascending into sky blue sunshine state skies. 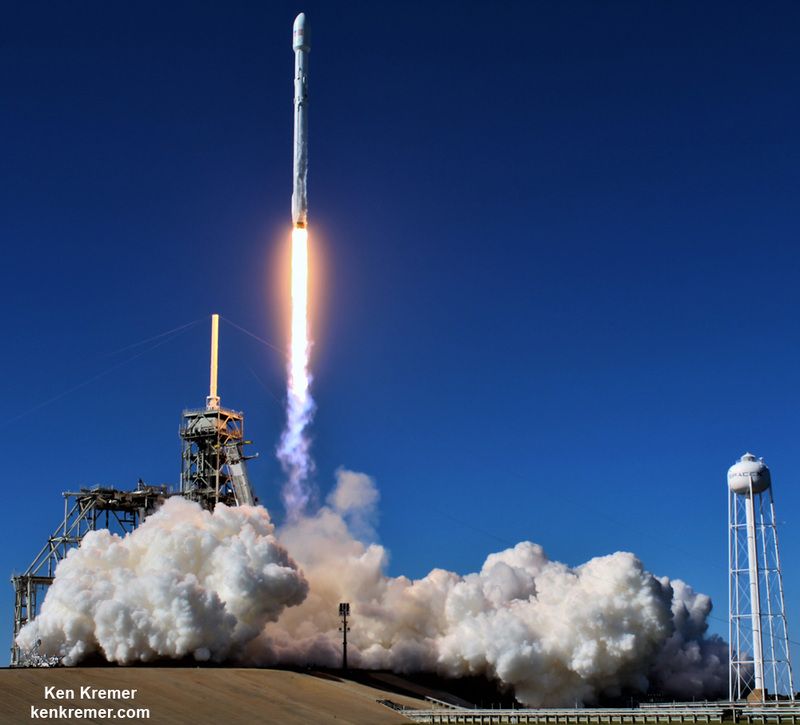 Despite long odds due to a high speed orbital delivery launch on May 27 as its primary goal, the spent Falcon 9 first stage managed to successfully carry out a rapid propulsive descent and soft landing at seas on a tiny ocean going platform. The May 27 landing was the third straight successful landing for SpaceX at sea and the second straight landing after delivering a commercial payload to a Geostationary Transfer Orbit (GTO). Watch for more photos/videos of today’s arrival in port in Part 2 soon.